Virginnie is a freckly gal who wears a wide straw hat to shade her from the southern sun. When a puff of wind sends that hat adrift in the swamp — right to the top of a sycamore tree — she braves some scary creatures to get it back! Crawdaddy craw, snickery snake, swaying gator. . . . What will she tell her mama at the end of the day? Lilting language and expressive collages paint a lush, lively picture of a determined young girl and her dauntless adventure. Behind the scenes: I was doing some volunteer work at a preschool when I couldn't help watching a very small girl in the school gym trying to throw a basketball into the hoop high above her head. The hoop was much too high, and the ball was much too heavy. But she persisted, throwing the ball again and again, totally oblivious to everything else that was going on around her. I wanted to write a story about a character with this sort of determination and single-mindedness. The first draft of the story did include a basketball, but I needed the girl in a setting that would allow for snakes, crawdads and alligators Common sense said that you don't take a basketball into a swamp for shooting practice. And so Virginnie's ball was changed into Virginnie's hat. With the summer coming and the hot sun beating down, Virginnie needs a hat to protect her freckled nose. So she buys a bright yellow hat with a nice wide brim. A big, wide brim is great for protection from the sun, but watch out for that wind. As the wind takes Virginnie’s hat on a merry romp the chase is on. 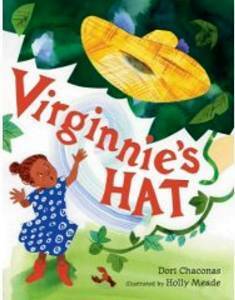 Virginnie’s hat leads her into the dark swamp and lands way up in the sycamore tree. While Virginnie eyes are set heavenward on her hat, down by her feet a swamp drama is playing out. The tension builds as Virginnie’s toes suddenly start to look like taste treats for the inhabitants of the swamp. "Virginnie’s Hat " by Wisconsin author Dori Chaconas is a delightful book. The rhyming text is sweet and flowing. Chaconas has a wonderful ability to choose the right words to set the tone. There’s plenty of humor which is sure to bring a smile to the reader. Caldecott Honor winning Illustrator Holly Meade brings the story to life with lively combination of watercolor and collage artwork that is a treat for the eyes.